French sculptor, painter, and author; born at Angers, department of Maine-et-Loire, in 1839. While still a boy he left his native city to seek his fortune in the French metropolis. In 1859 he founded, in collaboration with Valéry Vernier, the "Quart d'Heure Gazette des Gens à Demi-Sérieux"; devoting himself, at the same time, with great zeal to the study of art. He was commissioned in 1874 to make a reproduction of the famous statue of St. Francis of Assisi, which had been jealously guarded from the envious eyes of all artists in a shrine of a monastery in Toledo. He was thus enabled to carry out of Spain the first sculpturally exact and faithful copy of Alonzo Cano's masterpiece. It was exhibited in 1875 at the Exposition des Beaux-Arts, Paris, and the numerous copies taken from that exquisite model have made it a familiar subject with all lovers of art. Astruc is a member of the Society of French Artists, and has been for many years a faithful and prolific contributor to the Salon of the Champs Elysées, where his works have always called forth favorable comment. His talents are as varied as they are excellent, and he wields a brush as readily as a chisel. Particularly noteworthy among his paintings are his large panels in water-color, of which a series of six was purchased by the state and placed in the museum of St. Etienne. As a sculptor his reputation is even greater, and won him a prominent place among the best modern French artists. Rewarded at the Salons of 1882, 1884, 1885, 1886, as well as at the Universal Exposition of 1889, he is now "hors de concours." In 1890 he was decorated with the Cross of the Legion of Honor. The principal art works of Astruc are: "Mars et Venus," plaster group, 1886; "Hamlet," 1887; "Le Roi Midas," statue in bronze, 1888; "Portrait de M. le Comte Fabre de l'Aude," bust in bronze, 1888; "Perce-neige," statue in plaster, 1889; "Portraits Masques," 1889; "Le Repas de Prométhée," plaster statue, 1891; "Le Moine: L'Extase dans le Sommeil," marble statue, 1893 (bought by the government); "Barbey d'Aurevilly," bust in bronze; "L'Enfant Marchand de Masques—now in the gardens of the Luxembourg; "Le Saint-François d'Assises," statue—copy of the original of Alonzo Cano described above; "Manet," bust in bronze; "L'Aurore," bronze relief, now at the Ecole de Saint Cyr; "Le Sâr Peladan," salon of 1899; decorative figures for the exposition at Nice, etc. Astruc is, moreover, a litterateur of no mean reputation. Besides his early venture as editor of the "Quart d'Heure," he has written: "L'Histoire Funèbre de Faubert"; "Les Onze Lamentations d'Eliacin"; "Le Récit Douloureux"; "Les Quatorze Stations du Salon de 1859," a collection of art criticisms published in one volume, with a preface by George Sand. He has also contributed, as an art critic, to "Le Pays," "L'Etendard," "L'Echo des Beaux-Arts," "Le Peuple Souverain," etc. He is the author of several novels, short stories, and plays, among which may be mentioned: "BugMug,"a short story which appeared in the pages of the "Opinion Nationale"; "Sœur Marie Jésus," a novel published in the "Revue Germanique"; and "L'Arme de Femme," a comedy published in the "Revue Internationale." 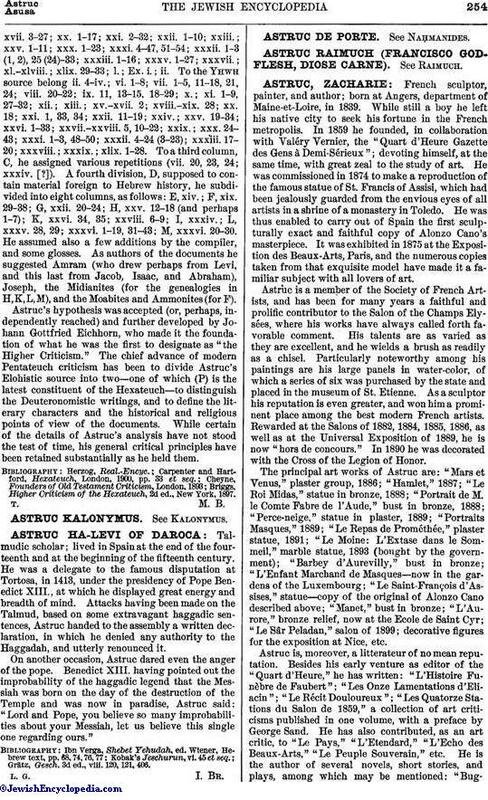 In 1863, in collaboration with the great writers of the day, Astruc founded "Le Salon," a journal devoted exclusively to art, and which appeared daily during the annual exposition. It lasted only for a short time. In 1870 he founded in Madrid another art journal, "L'Espagne Nouvelle," and wrote several sketches for different contemporary reviews, descriptive of his sojourn in Spain. 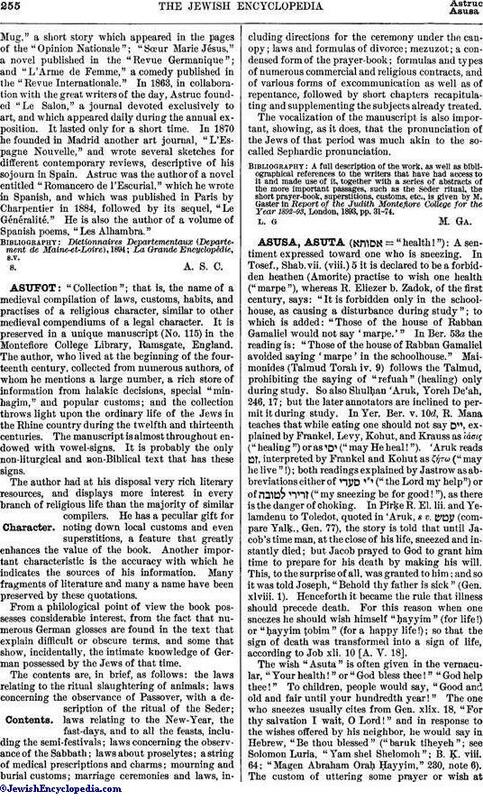 Astruc was the author of a novel entitled "Romancero de l'Escurial," which he wrote in Spanish, and which was published in Paris by Charpentier in 1884, followed by its sequel, "Le Généralité." He is also the author of a volume of Spanish poems, "Les Alhambra."